Sharp Pain and Tearing in the Bottom of My Arch and I Can’t Walk- What Should I Do? 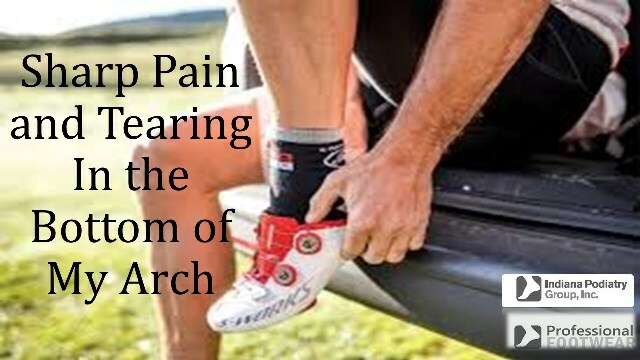 Heel and arch pain and injuries are common and can have a number of causes. There are a number of muscles and tendons running underneath the bottom of the foot, and a miss-step can strain these structures suddenly. However, these are by far less common than damage to a structure called the plantar fascia. A broad ligament on the bottom of the foot, the plantar fascia is injured usually by gradual strain. Called plantar fasciitis, this type of injury occurs over time, with a gradually increasing onset of heel and arch pain. This condition has a specific treatment course that varies slightly between physicians. However, when there is a sudden pain rush during a single step, and if a snapping, tearing, or pulling sensation is felt, the injury often involves a rupture or tear of the plantar fascia. The treatment for a rupture somewhat differs from fasciitis, and can make the difference between a quick recovery and a prolonged one. Plantar fascia ruptures can occur when there is a sudden force on the bottom of the foot (essentially from the ground) that stretches the plantar fascia ligament beyond its capability to stretch. The fibers typically tear in a partial manner, with most of the plantar fascia otherwise remaining intact. The injury often occurs when a force causes the toes to suddenly bend upward, which essentially severely stretches the plantar fascia, or when there is a direct blunt force to the plantar fascia that stretches a small section of the fascia beyond its limit. Stepping on a root or the broad edge of a rock while barefoot or in poorly supportive shoes or sandals can cause this to occur. Less commonly, the plantar fascia can rupture as a result of long term weakening from plantar fasciitis. Once the fibers of the plantar fascia tear, a snapping or tearing sensation can be felt, followed by a sharp pain that does not go away. Bearing weight can be extremely difficult, and pain can run the range from sharp to burning. It is usually felt in a very specific spot, although broader pain can be felt eventually. The key to plantar fascia ruptures is to immediately immobilize the foot in order to give the fascia relief from pulling every time a step is made, and allow the damaged fibers to heal. This is best accomplished by using a walking boot to redistribute pressure along the rocker-bottom sole of the boot, although severe cases may need full non-weight bearing immobilization in a below-knee cast. Typically, four weeks of healing is needed before unprotected weight bearing can resume. If the fascia is not properly treated, and left to ‘heal on its own’, the injured tissue is likely to take a very long time to heal, and could even persist for months to years. In these cases, the torn fascia tissue remains inflamed, and persists as a form of inflamed plantar fasciitis. If you suddenly feel pain in the heel or arch after stepping wrong (especially with a tearing or snapping sensation), and the pain does not go away within a day or two, it is a good idea to see us or your local foot specialist for immediate care. This could make the difference between a quick recovery and a protracted one.